I absolutely love kale. It is oh so very good for you. I feel healthier with each and every bite. I get it if it’s not your thing. No worries! More for me! One of the things I really appreciate about it is its sturdiness. It holds up (even dressed) long after lettuce and spinach have given up the fight. That makes it an excellent choice for camping and floating. This recipe is super simple and if you have any left over, it will still be good the next day. Plus, it’s pretty! And who doesn’t like eating pretty food? This slaw is light and tangy, if you want to add a little sweetness, try throwing in a handful of dried cranberries, or maybe a chopped apple…or live a little and add both. It goes great with grilled meat. 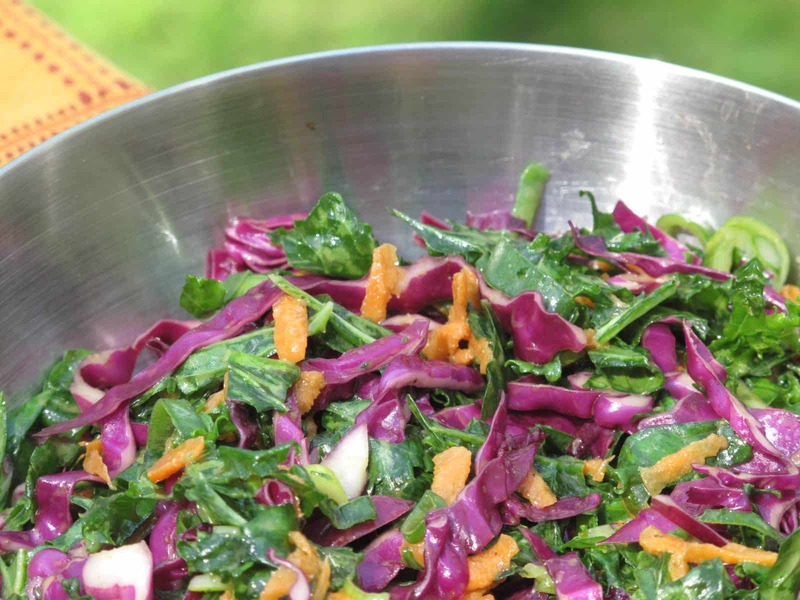 If you want to get ahead of the game before you head off on your camping trip, you could chop the kale and cabbage in advance. You could also get a nifty bag of those pre-shredded carrots at the store to save some time as well. I would pass though on the bags of pre-washed, chopped kale. My experience with those has included finding quite a few of the tough stems left on the leaves, which you don’t want in your salad, soups maybe, but not salad. Buy your kale in bunches and take the time to trim away those stems, it doesn’t take that long and it will be well worth it. Whisk the first five ingredients together in a large bowl. Add the kale, cabbage, carrots and shallot. Toss well until the vegetables are coated with the dressing. Add salt and pepper to taste.